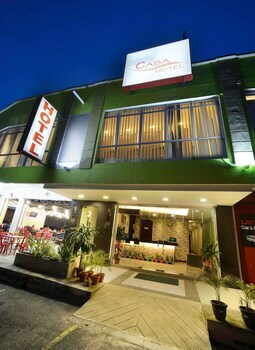 With a stay at Casa Hotel, you'll be centrally located in Kampung Salak, within a 10-minute drive of Sepang International Circuit and Taman Rekreasi Kuarters KLIA. The front desk is staffed during limited hours. Free self parking is available onsite. With a stay at Funky Crib Hotel in Kuala Lumpur (Bukit Bintang), you'll be a 4-minute drive from Pavilion Kuala Lumpur and 9 minutes from Petaling Street. When you stay at Villa Del Porto in Langkawi, you'll be near the beach and within a 5-minute drive of Tengah Beach. Limited parking is available onsite. With a stay at Skytree Hotel in Kuantan, you'll be within a 5-minute drive of Darulmakmur Stadium and Wan Fo Tien Temple. Located in Malacca (Bandar Melaka), The Jiong Guesthouse is within a 15-minute walk of St Paul's Church and A Famosa. Featured amenities include dry cleaning/laundry services and luggage storage.